Skinizer is a powerful multipurpose WordPress Theme. Because of the included pre-made skins you can create pretty much any kind of site you want to build. From a personal and business to creative and technology website. We’ve put much effort in designing the skins because we want to give each skin their unique look and feel. 12 Beautiful Designed Skins. All responsive and SEO Optimized. 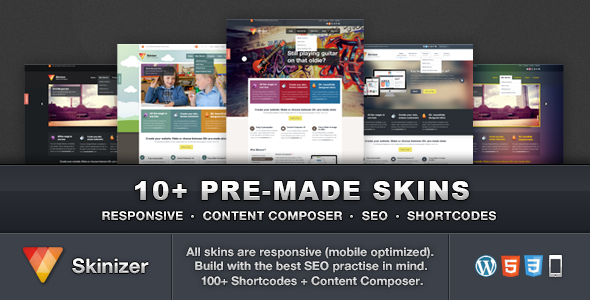 The Pre-Made Skins (Child Themes) are just a few clicks away when you’ve installed Skinizer. All functionality which is included in Skinizer, like you see in this demo, is available in all skins. The skins are beautiful and we’ve put much effort in them, but changing the skins is easy like the summer breeze. Content Composer v2 – Build complex layouts without shortcodes! We’ve build our first Drag&Drop Content Composer back in early 2011. And we’ve improved it along the way. Build complex layouts with just a few clicks. Integrate your blog / portfolio / staff / testimonial posts in any page. Each module has it’s own settings so you have total control on how the module looks like on your website. Skinizer is Responsive up to mobile. Your visitors with a mobile or tablet will get a version for their device. Responsive build for iPhone, iPad, Android phone and tablets and other common mobile devices. For us it was a priority, when building Skinizer, to get the best results in search engines when using this theme. The content block is placed before the sidebar so the content crawled first by search engines. Also we’ve improved the heading (H1, H2, H3, etc) hierarchy in the content and sidebar. So your most important titles are most important to search engines as well.